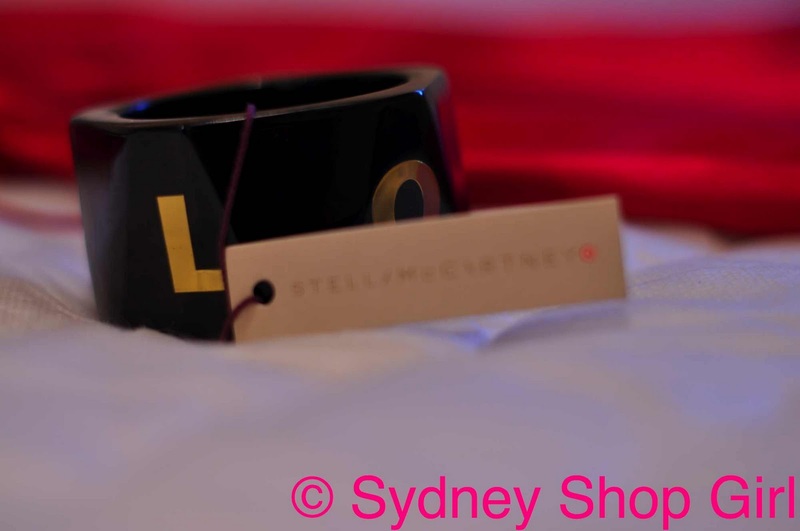 Sydney Shop Girl: The Last Stella McCartney Love Bangle At Target Rhodes Was Meant To Be Mine. The Last Stella McCartney Love Bangle At Target Rhodes Was Meant To Be Mine. It is a rather long title for a Friday blog entry but I feel that it clearly defines the key event of today. 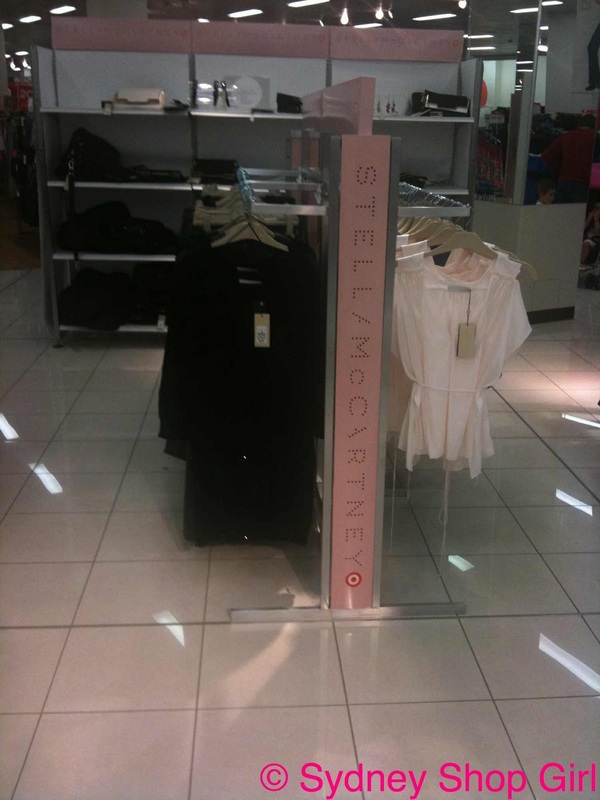 As promised, please find attached herewith, the SSG take on Stella McCartney for Target Take 2. This was the scene that greeted me at Target Rhodes, at 1708, Friday October 29, 2010. Today was a historic moment for me. It was the first time I've ever shopped a Designer for Target collection. 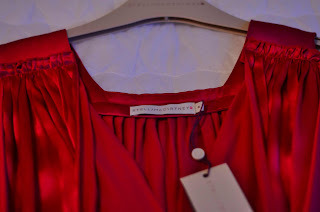 Something always seemed to come up with previous collections - work, not having a Target close by, a lack of adventure in my clothing choices, being overwhelmed by the long queues. This year however, the planets aligned. A Target opened in a shopping centre on the way home from work, I got out of work today at a respectable hour and my local Target was rather tranquil when I visited. Never one to let a full length mirror pass me by, I took a 'before' snap in the changeroom. 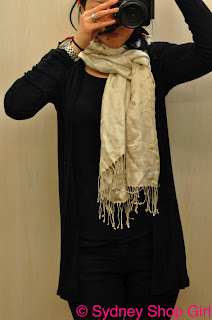 Black cardi and top: Cotton On, wrap: Oroton, jeans: Zara. I even got the chance to take a picture of my shoes. Black and gold flats: Zensu. 100% synthetic and rather comfy. Moving right along. 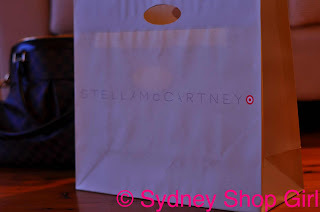 The Stella clothes. Much has been said about how the clothes look a little 'cheap' in real life. Especially in the silk look range of the collection. I was pleasantly suprised. This is the white silk look blouse with the navy tulip skirt. I was this close to buying the blouse - but $120 for Target. Synthetic Target. The blouses are rather long line so tuck in nicely. Might have to go back for this blouse. The tulip skirt made my bottom half look like it had air bags attached (from the side). Enough reason to put it back on the rack. What I was really interested in was the suit jacket and 3/4 tailored pants combination. The fit wasn't right on me but I felt that the suiting items of the collection were pretty well made. 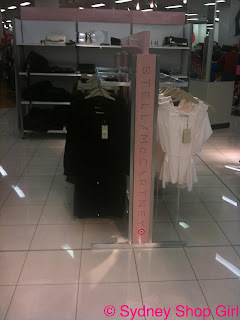 The prices were pretty steep though when compared with the non Stella items on the surrounding racks. The round necked jackets weren't terribly flattering. The fitted trench sold out in the smaller sizes so can't comment. 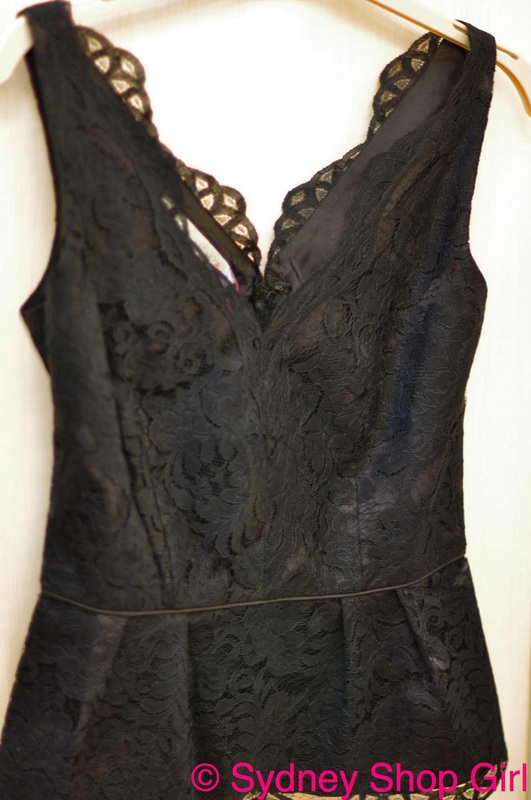 A feature of the collection was lace. The black lace shell was very pretty in real life. 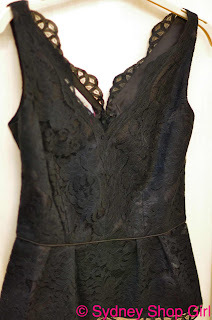 The 3/4 sleeve lace tops are have no lining. Not good for work. I bypassed the jeans - there were grey skinnies and faded denim flares at Rhodes. Why tempt myself? The biggest surprise for me were the dresses. They were actually wearable and the fabrics a fairly decent weight. It's hard to do silk look on the cheap-ish but I have to say, this collection worked. My favourite dress was the tunic dress. It came in a grey and a fuchsia. I gravitated toward the grey. 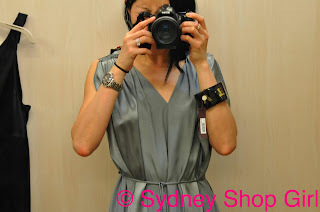 I then realized I already own several dresses in the black to grey colour spectrum. Then I remembered the wedding in Singapore and the unwritten rule of needing to wear Colour. You can guess what happened next. I'll keep you in suspense. I drove home from Target and got dinner started. 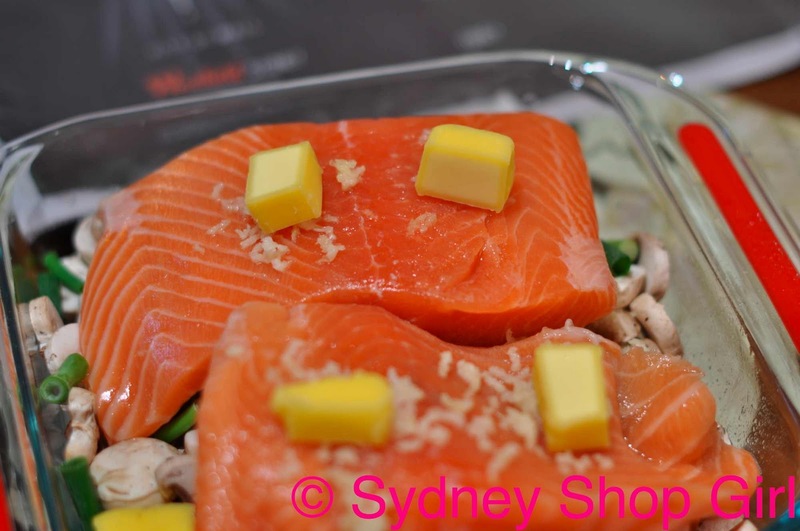 One of those arrange, place in the oven and forget affairs. Always good for a Friday night. So, while dinner is baking. Let's get down to business. There is a special Stella for Target shopping bag. And it's free. I even got to take home the Stella hanger. I got the last black and gold LOVE bangle at my local Target. I was just rifling through the hand bag area when my hand made contact with what felt like an acrylic bangle. 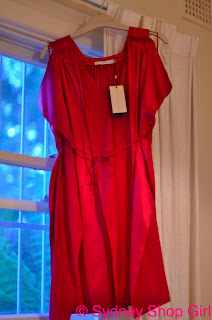 I also came home with the fuchsia tunic dress. The perfect dress for a location wedding. Plenty of room in the waist area for the buffet breakfast and copious amounts of food that Singapore offers. Faux Fuchsia, I salute your namesake colour. My plan is to wear both the bangle and the dress to the wedding in Singapore. It's a little SJP, I think. Will need to workshop hair options. But not now. Mr SSG is begging me to fix our broadband connection. We've signed up to a new ADSL format and apparently I'm the technical support person in the relationship. So I'll have to leave you for now. Wish me luck. Telstra isn't the most user friendly telco in Australia. damn, I forgot it was even happening!! last time I even took the morning off work! I want the bangle, had the bangle in my hand, and put it back. There was SO MUCH STOCK at my local Tarjay. I might go back and buy it. I like the blouse and tulip skirt on you...all those wonderful choices...glad that you grabbed the bangle...reminds me of the Marc Jacobs ones that I saw in Seattle for $300! I also like what you wore to go shopping. i like the bangle and the dress a lot, and how lucky to find the bangle all on its own hidden like that, well done! I was pleasantly surprised by the collection, really classy dresses and suits. Expect to see lots of girls wearing them during the melbourne cup carnival. Can't really see where else one would wear the suits. Hopefully I'll get there tomorrow and there will be stock left. If it is anything like last year (which I went to), it was bedlam. Hopefully it is calmer this time. Thank you, ladies for kind comments re the clothes.